Your office printer or photocopier is one of the most important pieces of technology in your office and it can be frustrating when it breaks down during an important print run. 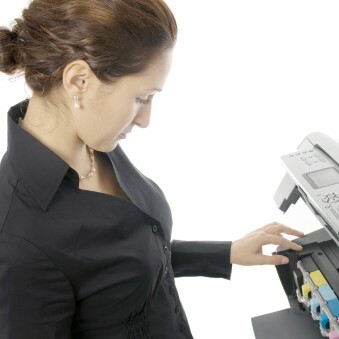 Regular maintenance can avoid the common office printer problems. – Use good quality paper. There are companies offering ‘great’ deals on paper; this is a false economy as low cost paper usually means low grade paper. Such products leave a residue of dust in devices causing unnecessary paper jams. – When placing fresh paper into the feeder tray, break the ream of paper into 3 parts to allow free flowing printing. If paper gets stuck in the printer, never force pull the paper as it will tear. Carefully use both hands to pull out the paper. – Quality is everything when it comes to toners; you pay for what you get. Cheap toners will affect print quality and cause ink clogging. Avoid refill toners, they may be less expensive to buy, but they have been pierced to refill with toner and they are prone to leaving messy ink in your machine and on your print-outs. – Compatible toners on the other hand can be fine to use on the advice of your office technology provider. These toners are usually high quality and are made in the same factories as branded toners, and they are less expensive to buy. – Shake toners gently before installing to avoid print head clogging and to get the most out of toner capacity. – For colour printers, don’t always print in black and white. Using the colour toners to print occasionally will allow ink to flow freely from the print head. – Always power the printer off before attempting to resolve an internal issue. Some parts can be hot to touch. – Dust needs to be removed from the photocopier regularly but our advice is to leave this to the professionals. Specialist vacuuming and cleaning of the inside of the device is required, just like cleaning the internals of a car engine. – Remember to update software when prompted, as this can improve your printer’s performance and guard against security violations. – Never move a large office printer, as you could damage it and injure yourself. Always contact the printer provider, who is trained in manual handling and other safety procedures related to moving devices. – Keep the top of the printer clear of objects and drinks and never allow Tippex, blue tac and staples to go through the printing or photocopying process. – Never use tools or instruments on the multi function printer without guidance from the printer provider. A commonly used kitchen knife can cause irreparable damage! – Keep paper settings on the computer the same as printer settings, for example if you require an A3 printout, ensure that the A3 paper tray is selected. – Always follow the instructions on the inside door of the photocopier to clear paper jams. – Just like a vehicle, an annual service will ensure that you maintain your office printer and get the most out of it. – Stick to the monthly cycle limit for printing, if you are printing more than the limit, then it is time to upgrade your printer. – Contact us for further help. We may be able to resolve the issue over the phone, if not we will call to your premises. This is an integral part of our cost effective Managed Print Service and ad-hoc printer servicing and printer repairs is also an option!